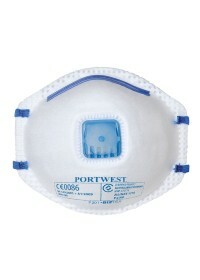 These disposable masks and respirators are rated in FFP1,FFP2 or FFP3. Filtering Facepiece Protection, is the type and size of particulates that are allowed through the mask. They cover applications such as smokey, oily sprays or just dust particles during use. It is important to remember that disposable FFP masks offer no protection from gasses, for that you will need full filter respirators. Use of masks is required where the occupational exposure limit value of the particles exposed to, such as aerosols, dust etc, exceed the time where is starts to get hazaroudous to our health. Particle size of up to 0.6 μm (1 μm =1000th of a mm μm = micrometre) and FFP1 Masks, FFP2 Masks and FFP3 Masks offer various protections against different sizes of particles, FFP3 being the most effective at filtering the smallest particles.